Make your own Anti-Static Bags and Anti-Static Sleeves. Ideally suited for the storage and packaging of all your static sensitive products. The Riverside Anti Static Pink Poly Tubing is available in sizes from 2" to 24" wide and in 2 mil, 4 mil and 6 mil. Pink Anti Static Poly tubing meets full static decay requirements of MIL-PRF-81705D, Type II and EIA-541. Surface resistivity of 1012 ohms/sq.in. Amine-free. 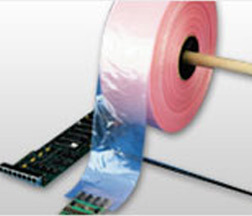 Pink Anti Static tubing is designed for applications in which Faraday Cage Protection is NOT required. All sizes come on 12” diameter rolls.